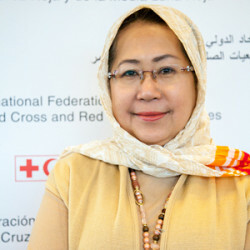 Dr. Jemilah Mahmood began her mandate as under secretary general for partnerships at the International Federation of Red Cross and Red Crescent Societies in January 2016. Before joining the IFRC, Dr. Mahmood was the chief of the World Humanitarian Summit secretariat at the United Nations in New York. She is well known as the founder of MERCY Malaysia, which she led from 1999-2009, and her previous appointments include chief of the humanitarian response branch at UNFPA; senior fellow at Khazanah Nasional Berhad in Malaysia’s Khazanah Research and Investment Strategy Division, and senior visiting research fellow at the Humanitarian Futures Programme at Kings College in London.